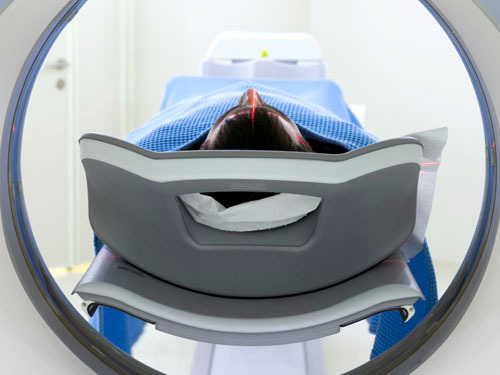 In radiation therapy, line lasers are used to position a patient in a magnetic resonance tomograph (MRT) or computer tomograph (CT). The exact position of the patient is extremely critical in exposing the patient to the correct radiation dosage. Line lasers or cross-hair lasers with red or green wavelengths are particularly well suited for positioning purposes. The emissions produced by laser class 1 laser modules are harmless to the patient and are, therefore, often used. Line lasers are commonly integrated into a complete system with optical monitoring. Thanks to the use of intelligent software, the patient can even be shifted automatically.